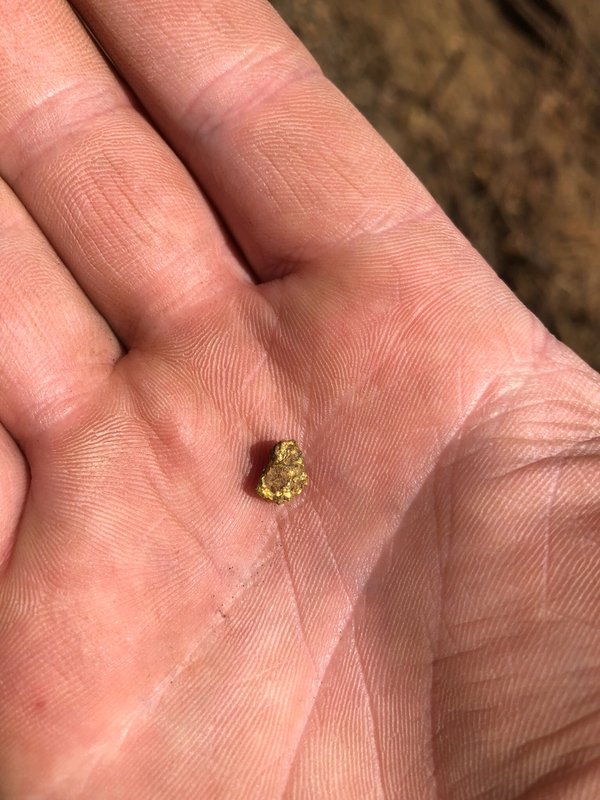 I have never found a gold nugget detecting before and always thought it odd since I detect gold rush sites. Today I got a faint signal on my Deus while running 17k. I figured it was either a .22 bullet or a deeper small target. Out of the ground came this little gem. 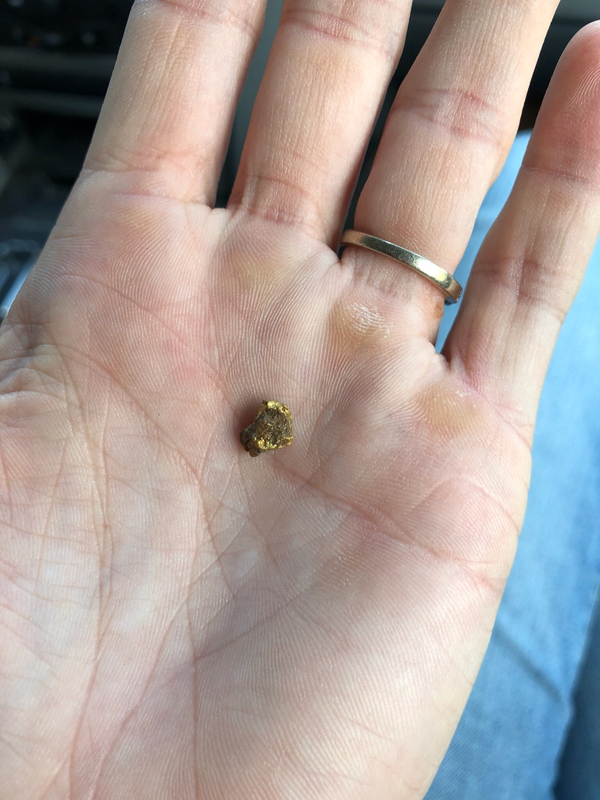 I guess you would call this gold ore and not so much a nugget. Now I know what gold sounds like. Rang up solid 76 at 1 inch, on top of shale, mid slope of a large placer ridge. That's a nice little chunk !! I am going to melt them down and make a Wedding ring out of them for my son n law as he has a tungsten that doesn't fit anymore and he can't size it. I’m going to make a necklace out of this piece. It is my wife and I’s anniversary today and I found it on her parents property. Only fitting... she wanted earrings from the cache I found but I didn’t want to break the find up . I got lucky. Dont pass up a faint .22 bullet target I guess. My HF coil would have hammered it. That's a great idea.. I figured if you sell it.. sure you get a few bucks but that's spent very quickly but if you make something out of it .. it will probably stay in the family for years to come. I remember your Cache that was the find of a life time.. can't blame you for keeping it all together..
Congrats on an amazing find! That’s really cool, something he’ll probably really appreciate. That’s awesome! We have plenty of great stuff on the east coast, but the only nuggets we find are in the porcelain bowl after corn on the Cobb. Last edited by ChrisMD; 09-06-2018 at 10:38 PM. I sold one of my first finds. I regret it and will never sell another item unless it is worth a crazy amount of money. I really like your gold ring idea. Lets hope it stays in the family for generations. That's definitely a nugget, not ore. What an exciting find. If I were you, I'd do some sampling in the area with a pick and shovel and panning. You might find a streak or pocket of gold. [QUOTE=NMsilver;3000113]That's definitely a nugget, not ore. What an exciting find. The nugget was right below a placer mining cut sitting on top of exposed shale bedrock. There was a gold rush mining cabin on the edge of the cut that was obliterated. We will poke around there periodically and see if we can find some more. Lets hope I can post some more picks from my pan or sluice in the future. Great find and Happy Anniversary! From the looks of your palm, the age of your calluses there and how your wedding ring is grown into your finger like barb wire around an old tree, may I guess its your 40th? Oh and she is pregnant! Congratulations on all counts Brother! Hoping to see some nice sample pans from the area. That’s pretty darn cool. I don’t expect I’ll ever find something like that under my coil but I’d like to hope.